Morrissey is to sue the NME after it failed to apologise for an article focusing on his views on immigration. The magazine criticised the former Smiths star for allegedly telling a reporter Britain had lost its identity due to high levels of immigration. An NME spokesman confirmed they have received two writs for the magazine and its editor Conor McNicholas. "NME takes the matter extremely seriously and we are in discussion with our legal representatives," he added. A deadline to print the retraction passed at 1300GMT on Thursday. In a statement, the singer's lawyers said: "Their only response to this deadline was to say that they 'do not have time to respond to the allegations.'" 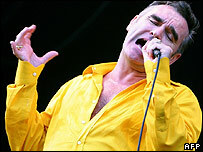 The magazine quoted Morrissey allegedly saying: "Although I don't have anything against people from other countries, the higher the influx into England the more the British identity disappears. So the price is enormous. "If you travel to Germany, it's still absolutely Germany. If you travel to Sweden, it still has a Swedish identity. "But travel to England and you have no idea where you are," the singer is reported to have said. The 48-year-old, who has spent the last decade in Rome and Los Angeles, was apparently responding to a question about whether he would return to live in the UK. In a follow-up interview concerning his comments, the NME reported that Morrissey had said: "It could be construed that the reason I wouldn't wish to live in England is the immigration explosion. And that's not true at all." "There are other reasons why I would find England very difficult, such as the expense and the pressure," he said. He is alleged to have added that he did not think his comments were inflammatory, but were "a statement of fact". The singer's manager accused the NME of "character assassination" on the singer's fan website, True To You. Tim Jonze, the freelance journalist who interviewed Morrissey, told the BBC that he didn't approve of the singer's comments and had found them "offensive". He said he had asked for his name to be removed from the article because it had been rewritten. "I didn't want my name on something I hadn't written, even if some of it might have been similar to what I wrote originally," he said.